Ain't That Sherific? : Leg Update . . .
Leg Update . . . 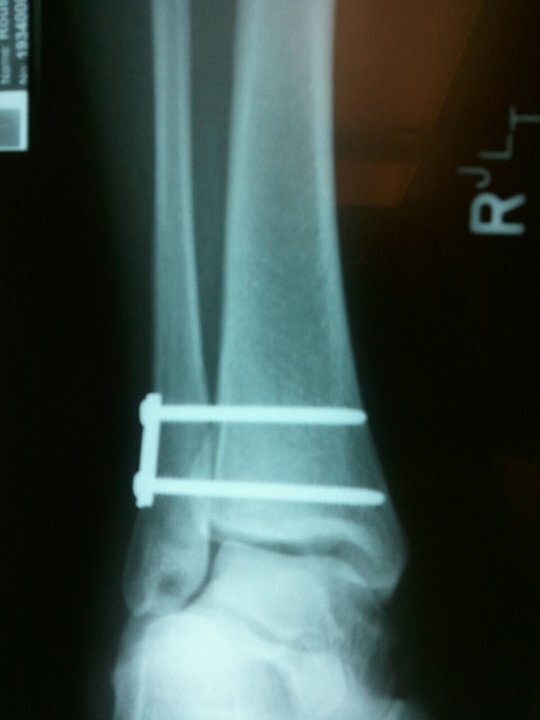 I have been down for almost 2 weeks with my broken leg. No weight bearing and elevation 24/7 has been the only thing on my menu. I am not gonna lie, it has been rough. I am so sick of laying around that my computer and cable television no longer keeps me occupied. I will say that one of the first things I am going to do when I get up is to paint the ceiling in my living room! Today I ventured outside to go to the doctor. I have been praying that I could get the hard splint cut off my leg. It has drive me absolutely batty! My leg is wrapped in a large gauze bandage and their is casting plaster running up the sides of my leg, allowing my leg to swell and contract. It is then wrapped with an ace bandage. It feels like a saggy sock that is scrunched down and you are unable to pull it up. I must admit I did unwrap it a couple times and re-situated it. I could. not. take. it. any. longer. 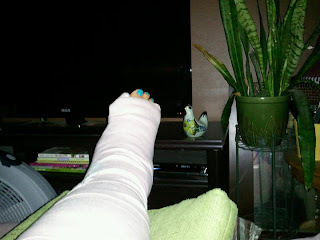 As soon as I was taken into the "casting room" at the doctor's office I was thrilled to hear the splint was coming off. My leg was thrilled to be free of that itchy, irritating splint. It felt great to rub my skin and feel the air! After 13 days it is the little things that make you happy! Ugly bruising and swelling. 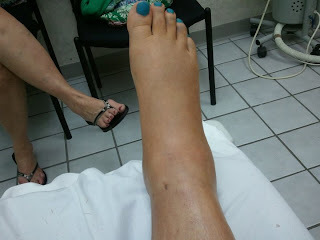 Nice cankle eh?! 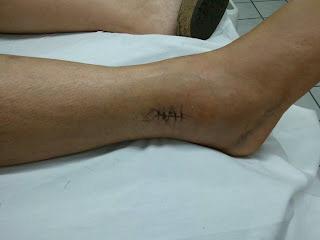 Stitches were also removed today and they added some surgical glue and steri-strips. Those can come off in a week. She said they will come off on their own, but if they are peeling and icky I can take them off. Little did she know that I am a picker! 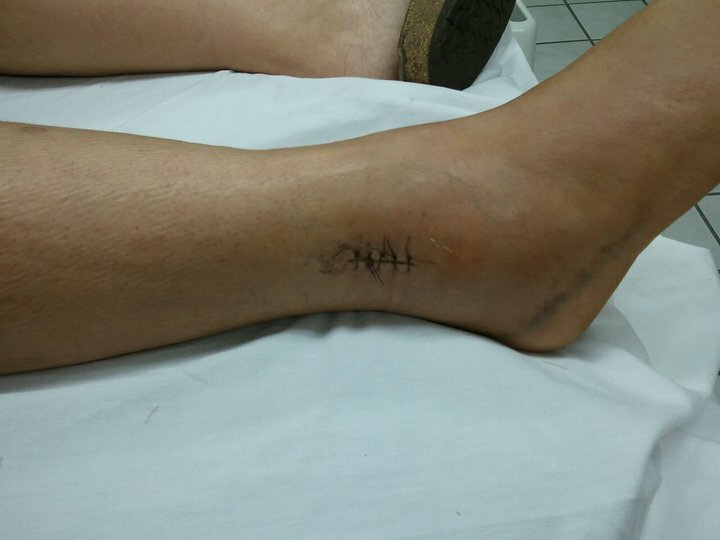 The plate and screws are holding the ligament in place for healing. I was put in a ankle immobilizer boot and I am still not allowed to do any weight bearing for 4 more weeks. No driving for at least 2 months. I am supposed to take off the boot at least 3 times a day and work on my ankle mobility for 15 minutes each time. That sounds fabulous, the reality is that it hurts like a BOOOTY! The good news is that I can shower without the boot! Yay! I am also allowed to go back to work with restricted duty next Monday. I am looking forward to getting back into a routine and getting my life back. I have been authorized to get one of those scooters that you place your knee on and walk, that will make my life oh-so-much easier. 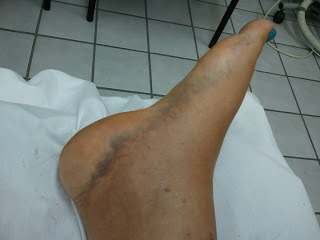 While this has truly sucked and been very painful I am very lucky that I am this far into my recovery already. I am blessed to have a boss who is understanding, a husband and kids who are super helpful and a wonderful doctor and staff. Thanks for all the kind words on facebook, the food brought over by friends and all the kind texts and emails. I am blessed! I'm so glad you got the splint off and can get around a little better! Besides the ankle exercises (which sound awful), is the pain any less than it was? I sure hope so!